Just text "HELL YES" to get booze delivered to your door. When you want to get your drink on, who can be bothered to walk all the way to the liquor store? Or, worse, pick up the phone to order a delivery? What a hassle. If only there was a way to simply text someone to bring your spirit of choice right to your doorstep. Rest easy, boozy reader, because now there is. That’s right, the same team that brought the drinking-themed social app Swig has now created a text-message based liquor delivery service, fittingly called DrinkEasy. How DrinkEasy works is pretty simple. 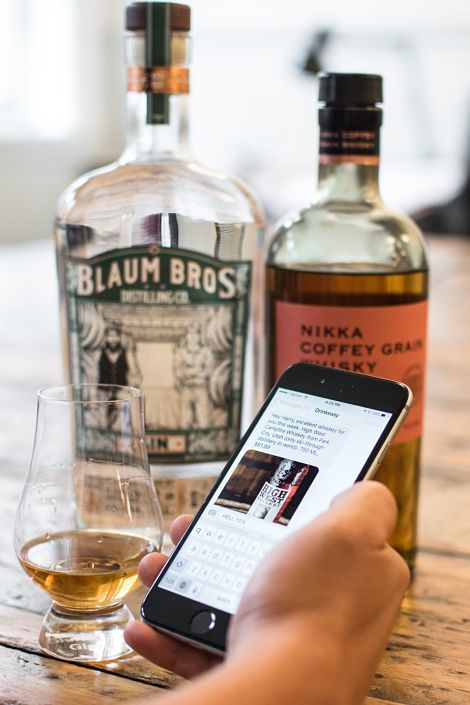 You text “DRINK LOCAL” to 646-681-4442, and one of the service’s alcohol experts will send you recommendations on craft spirits from smaller batch providers all across the country. (These are not the guys to hit up for a bottle of Popov.) When and if you see something you like, you simply text back “HELL YES.” (Apparently “FOR REALZ, BRO” and “DADDY THIRSTY” didn’t test well with Beta users?) From there, the drink expert sends you a link to a secure website where you can put in payment and address info, and you’re all set. Everybody ready to party? The booze is on its way. Well, sort of. DrinkEasy’s deliveries arrive in two to four business days, so it’s not exactly your ideal concierge service for hosting after-hours drinks. (Hey, there’s always the bodega!) But the guys from DrinkEasy are hoping their real business model will be less about booze-on-demand, and more about introducing users to finer, rarer spirits that aren’t available at liquor stores in their area. It’s for aficionados, not winos. Wait, did we just find their slogan?